The Stonemaul ogres have been part of the Horde since Warcraft III, so this pitch is not about them being recruited into the Horde. Instead, this is a story explaining the fall of the ogre race to be the result of Cho'gall's machinations, and how the ogres must be saved to be a great asset to the Horde once more. Further, it involves the Stonemaul ogres claiming a new home for themselves, transforming the highborne ruins of Dire Maul into a new ogre city, since it already shares a lot in common with the imperial ogre architecture. With the Alliance and Horde preparing for war once more, the Stonemaul ogres have risen to secure their place on Azeroth. The shattered clan has traveled to the ancient city of Dire Maul to restore into a new home, but all is not well. Cho'gall's brief stay in the city following the Cataclysm has left some lasting curses, and secrets that change what we know of the ogre's history. Within the deepest of the Shen'dralar archives the forgotten Forger Stone is rediscovered, not seen since the fall of Highmaul. Proximity to the artifact begins causing odd behaviors in the Stonemaul clan, and flashes of memories long thought lost. Through this journey into memory, a secret history of the ogres is revealed. During the rise of the Horde, Cho'gall besieged Highmaul and burned Imperator Mar'gok alive in his own throne. He did not simply leave after this moment, as long believed. Cho'gall returned to the Chamber of Nullification and cut down the Forger Stone from its chains. Cho'gall's vengeance was satisfied with Mar'gok's death, but his lust for power was not so easily quenched. Tapping into the Forger Stone using the power of the Void, Cho'gall exploited its side effect of draining the life force of those it affects, to cast a curse of an unprecedented size. Tracing the shape of the tattoos that all ogres of the Gorian Empire had applied when they were young, Cho'gall cast a spell from the Forger Stone on all living ogres. The spell radiated across Draenor, but it went by mostly unnoticed at first. The curse was subtle and slow-acting. At first, it mostly calmed the ogres, taking their worries away. The insidious part would come later, as it slowly took their memories and made them open to suggestion. By the time any ogre mage realized what was happening, it was too late. The ogres had been diminshed. Made ever so much more simple, the ogres forgot who they were, forgot their ancient greatness, and began to follow whoever made the largest show of strength. Ultimately, this was Cho'gall's true goal. Once he became the chieftain of the Twilight's Hammer clan, Cho'gall called upon many of the ogres he had cursed, and they came to his side without question. The power of the Void was great enough to sway Cho'gall when his mind was clear, so it was more than enough to sway an army of addled ogres to follow his every order. Only his most trusted followers would be granted a way to counter the curse and regain their full strength. This new information changed everything for the Stonemaul clan. It was determined that the curse of the Forger Stone must be broken, but the stone appeared to be unbreakable. The ogres called upon their new nightborne allies, and together their spellwork managed to undo the dark magic that had bound them for so long. With the curse broken, a fog lifts from the minds of the ogres of Azeroth. Many are drawn to Dire Maul to discover the source of their rejuvenation. In the aftermath, the ogres work together to rebuild Dire Maul into the capital of a new empire, New Goria. Ogres respect strength beyond all else. This often manifests as ogres challenging their leaders in order to succeed them, and many clans have a long history of deaths due to this practice. However, this does not mean that they do not respect the strong that have fallen. Most ogres have a patron hero for the path that they follow in war. The ogres that became available to Ner'zhul and later Arthas had only a fraction of the magical potential that the sorcerer-kings of the old empires had. This made them less than ideal candidates to wield the power of the dead, but that did not mean they didn't have their uses. Kor'ush was a legendary brute, his natural strength enhanced by the power of the Scourge. He survived the fall of the Scourge and made his name slaughtering an entire army of naga who encroached upon the shores of Northrend. Molpadia was a nomadic huntress in the old days of Draenor, appearing as if from mists only to return to it after her hunt was over. Legend has it that Molpadia once challenged the Thunderlord clan of orcs to a great hunt against the best of the Breakers. While the initial deal was to send three orcs to match her much greater size and strength, over the course of the hunt, more and more Thunderlord orcs were added in order to keep up with her. By the end of the hunt, it is said that the entire Thunderlord clan had become involved, and yet Molpadia still emerged victorious. Some say that, despite the great passage of time, Molpadia survived to the present era, traveled to Azeroth, and founded the isle of Ogrezonia personally. Contrary to popular belief, the art of sorcery stretches back to the earliest ogre history, their mastery of the arcane arts a result of their titanic heritage. Gorgog is not simply the patron of ogre magi, but the greatest hero of all ogres. In ancient times, the ogres had fallen into slavery by their forefathers. The arakkoa sought to teach them arcane magic in order to deal with the ogre's masters, but Gog was far more ambituous than that. Gog mastered the arcane easily and then went after the gronn, who had been considered gods. Gog killed the gronn and feasted upon them to prove their mortality. With the ogres emboldened, Gog took on the title Gorgog the Gronnslayer, formed the Gorian empire, and defeated both their old masters and the arakkoa. The wizened discipline of the monk was once thought beyond the reach of the brutish ogres. However, the effect of the Apexis crystals in Ogri'la created a new generation of ogres whose broken world gave them a different perspective from the first ogres exposed to the Apexis crystals. The storyteller of Ogri'la, whose true name is not known, has now become the mentor to any ogres willing to learn a more restrained form of combat. The ogres have always had entities they consider gods, and those who sought to wield the power of their gods for their chosen. First it was the Forgers, then it was the gronn. Perhaps the power that has had the most lasting impact on the ogres, however, has been the Void. Even though the Stonemaul clan has no love for Cho'gall or the Twilight's Hammer, the ogres' respect of strength cannot deny the power that Cho'gall had discovered. Even to mortal enemies of Cho'gall's legacy, he is a symbol of the great potential that an ogre can reach, and even if they risk their sanity, many ogres attempt to follow in the footsteps of that greatness. No one believes ogres can be stealthy and ogre rogues, then, must not exist. Some say that Dagg'um Ty'gor was simply a mage who was a master of invisibility spells, but he changed the course of the Gorian Empire. A succession crisis once led the empire to having two Imperators who both insisted they were the rightful ruler. Dagg'um's use of subterfuge changed the course of the war, but it was all in the name of stability. At the end, neither Imperator survived, and the next ruler was a son that no one had previously realized existed. There are some who say Dagg'um Ty'gor never really existed and the war ended on its own, but there are those that believe in him to this day. 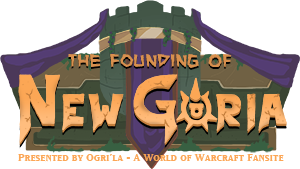 One such believer is Dagg, a young ogre who has begun to train a new generation of ogre ninjas in New Goria. Shamanism is something that ogre culture has never fully acknowledged. They initially dismissed it as a quaint habit of the orcs, but after seeing its true power, they sought it for themselves. While these experiments ultimately led to the destruction of the original Goria, a tradition of ogres continued to experiment with the power. Har'gunn was a one-eyed ogre mage before he lost his eye and replaced it with a stone he discovered to have a resevoir of elemental magic. From that moment, he turned to shamanism and laid down the foundation for understanding its secrets that continues to this day. One may expect the ogres to distate fel magic, since the Burning Legion incited the final downfall of their empire and their world, but that only encourages the ogres. Dentarg himself may have helped Ner'zhul set up the spell that tore their homeworld to pieces, but that only proved to the surviving ogres how powerful he and his magic were. While fel magic is unpopular in ogre lands, its power cannot be denied and thus it has its share of followers nonetheless. Warriors, to no one's surprise, are the oldest and one of the most revered of all ogre professions. Before the arakkoa helped them realize their titanic potential, ogres went into battle with just their fists or a single makeshift weapon and conquered their foes with brute strength. Brute strength means nothing if you never get the chance to use it, however. Mug'thol may not be an ancient hero, but he made a name for himself by not only managing to break free from Sylvanas' mind control, but by managing to survive an assassination attempt she had ordered on him. The ancient night elven city of Eldre'thalas was once an archive of the greatest of the highborne's secrets. After the Sundering, it became an infested ruin, but it was too important to leave completely abandoned. Now the Stonemaul ogres, long fighting for their place on Azeroth, have moved into the city and mean to return it to its former greatness. In the center of the Commons is a great arena. Even while ruined, the Crimson Ring ran gladitorial games in the Maul, their most famous combatant being King Varian Wrynn himself. Now restored to an elaborate arena, the Maul is an active gladitorial arena that no long attempts to hide the bloodsports that are played within its walls. The Maul remains a free-for-all arena for players of both factions. Crimson Ring representatives exist in several locations, including a safe distance away from the entrance to Dire Maul, to transport Alliance characters into the arena who would otherwise be in danger entering the city. Known for years as the Gordok Commons, the area has been rebuilt for a new generation of ogre nobility. This is the most elaborately decorated section of Dire Maul, meant for the best of the best ogres. At the northern end is a great palace that overlooks Lake Dumont. Within the palace, the Imperator sits upon his thorne, but during the night it's said that he takes pleasure cruises on the lake in his personal boat. Once known as the Shrine of Eldretharr, the ogres have repurposed the shrine to instead honor some of their greatest heroes. In the center is a statue of Gorgog the Gronnslayer, but all around the center are representatives of heroes of differing paths. All ogre classes can find trainers and useful NPCs here, and representatives from other Horde races provide services for other classes in a small ambassador's camp. This area has been largely rebuilt into a residential and market district. The largest variety of ogres live and carry out their work in this area, and it provides a majority of the city's services. While many of the secrets of the highborne were destroyed between the Sundering and the battles for Dire Maul, the sorcerers of the Stonemaul clan has still found it an inspiring place to study. Nightborne can also be found conducting research in the area, but perhaps most surprising are a handful of Shen'dralar agents that remain. The situation is tense, but an agreement has been forged between them and the ogres, since the ogres know there are some secrets in the city they will never uncover without the ones who buried them to begin with. After having spent nearly ten thousand years as the prison for a void terror, the fabric of reality in this region has not fared well. Never shying away from danger, the ogres have used this to their advantage. Not only is a magical research station set up in the area, many experiments are constantly underway. Portals to other cities and useful locations are maintained here on an hourly rotation. Also, a group of ethereals who run Void Storage and Transmogrification services have been drawn to the area. Located outside the city's limits is a rift in the cliffside. Inside is a strange anomaly that is being watched over by ogre sorcerers, night elven magi, and a team of timewalkers headed up by Zidormi. This location provides access to old Dire Maul content, particularly the three dungeons, for players of both factions. EDIT 1: Added Shaman and Monk back into the Class list. Last edited by Jokubas; 2017-11-12 at 11:47 PM. Good ideas man and yeah Dire Maul could work as a city for them. Also I can't wait to see if Blizzard sees this thread...I'll support you man. Time may prove me wrong but I would think if we get ogres they would be added like a normal race as they would be fully unique rather than offshoots of already playable races like the six allied races we have coming. Allied races just seems to be Blizzard's twist on sub races so far. This idea originated a little while back when I looked at Dire Maul and realized it's extremely similar to the artwork of Goria. I was originally more torn about the idea, since I hate taking cities away from the original owners and the Shen'dralar are still there last we knew, but Battle for Azeroth dividing the continents by faction made that decision a lot easier. That, incidentally, is also why this heavily involves a new city despite Allied Races currently not expected to officially have capitals or anything. Dustwallow Marsh is certainly an unused zone enough to use for the ogres, but I really want to see an intact ogre city, and I think Dire Maul is ripe for using that way. It's hard to say at this moment. While the Highmountain Tauren and Lightforged Draenei are essentially just different customization options for existing races, that's not exactly true of all of them. I didn't see the UI for creating an Allied Race, but I almost feel like the reason they went with the name "Allied Race" rather than "Subrace" is precisely because they didn't want all Allied Races to have to be considered a faction of an existing race. I'd definitely prefer ogres to be treated like a main race when it comes to all of the features and attention on their faction, but it's hard to say how much Allied Races will suffer from that yet. Last edited by Jokubas; 2017-11-12 at 04:10 AM. I tried to keep the initial post as simple as possible, but I still just imagined the racial abilities I came up with for ogres years ago. Feel free to discuss other possibilities, since something like Plainsrolling was always just a joke inspired by the old Plainsrunning ability anyway. The titanic heritage of ogres gives all ogres a slight affinity for manipulating the basic rock of the world, increasing your Mining skill by 15, allows you to mine faster, and to do so without a Mining Pick. You're granted bonus reputation when you gain reputation from a kill. Calling upon the power of your ancestors, you transform into an Ogre Lord, increasing your mastery rating by X and the percentage of your Two Heads are Better than One or Pureblood racial abilities by Y for 10 sec. You curl into a ball and barrel toward a selected enemy within 30 yds, dealing X-Y damage and granting you Momentum. Your two heads contribute to double the thinking (sometimes), providing an X% chance that your spells and abilities will fire up to two additional times at 30% effectiveness. You were born with only one head, but that only makes it easier to focus on more efficient ways of smashing, increasing your Versatility by X%. Last edited by Jokubas; 2017-11-12 at 11:50 PM. I like this. I'm a big fan of Ogres taking their rightful place in the horde, and this sounds like a good way to do it. I support this whole heartedly! I have long been waiting to embrace my ogre within! I was thinking...with the Night ones home gone, they could take over the zone of Feralas and rename the city in the middle Eldre'thalas. If you are wondering too they can just take the stuff from Feralas and add it to Dustwallow Marsh like the Tauren Horde Camps taking over the Grimtotem ones etc.. I seen your idea too about having a city of the Stonemaul City, but decided it could just be Dire Maul. As an Allied race... no; as a regular race... yes. Ogres deserve to be featured as one of the main races of the game... not as a background race. P.S. As an Ogre fan, I don't see why you want them as an Allied race. For Christ's sake, the Worgen and Draenei are main races, yet you want to put Ogres as a side-race. Last edited by In Ogres We Trust; 2017-11-12 at 04:46 AM. I'd love to see them added as an Allied race. I don't see Blizzard redoing Dire Maul for it. Considering it is mainly an elven ruin of which Ogres hold a part. It doesn't add much to the Ogre experience for me anyway. And it's an active dungeon site. What Ogres lack, are good hero characters for us to get insight into their personalities and faction. Cho'gall is one of the characters of WoW I love the most, but he was mad and evil. We don't have much in the way of Ogre characters that aren't jokes or villains. They are just going to give us Rexxar again. Who isn't even an Ogre, but a Mok-Nathal crossbreed. Ogres should go to Alliance, just to shake things up a bit. They can write the lore so it works. I would pretty much bank on there never being a single playable race added to the game at all ever that's not through this feature. That is the entire point of the feature, so they can keep adding new races whenever they want. The reason what they're adding right now isn't that much different than what we've already got is that they would have to make all the armor in the game work for that race among other things. Makes sense they would open the feature up with races they don't have to do so much work on. Last edited by Shakou; 2017-11-12 at 06:15 AM. I definitely think there's room for Ogre Monks. Brewmasters have been everywhere across Azeroth, and with Ogres being one of the more prominently distributed common races around Azeroth, I find it highly unlikely if Ogres didn't take up being Monks. Ogres love getting drunk and punching things, too, I imagine. They probably get along great with Pandaren. Also, Ogre Shaman is just a given, I think. I think you are nervous that they will actually do it. I'd honestly be very confident in saying that ogres are a "when" not an "if" for playability but I definitely wouldn't do them as an Allied race. It doesn't do them any justice. Why does this come up every single time Ogres do? Its a horrendous idea. The people who mostly want to play ogres are predominantly Horde, the history is Horde, the closest to a notable ogre character is Horde (Rexxar)and there are already several clans of ogres that are part of the Horde. Do you want another decade of whining similar to High Elf fans? Because that's what happens when you put things where they don't belong just to "shake things up a bit".